In Uncle Silas, Maud Ruthyn, the young, naïve heroine, is plagued by Madame de la Rougierre from the moment the enigmatic older woman is hired as her governess. A liar, bully, and spy, when Madame leaves the house, she takes her dark secret with her. But when Maud is orphaned, she is sent to live with her Uncle Silas, her father’s mysterious brother and a man with a scandalous – even murderous – past. And, once again, she encounters Madame, whose sinister role in Maud’s destiny becomes all too clear. With its subversion of reality and illusion, and its exploration of fear through the use of mystery and the supernatural, Uncle Silas shuns the conventions of traditional horror and delivers a chilling psychological thriller. I’ve been taking part in the 2016 Classics Challenge, hosted by the lovely Stacey of The Pretty Books. 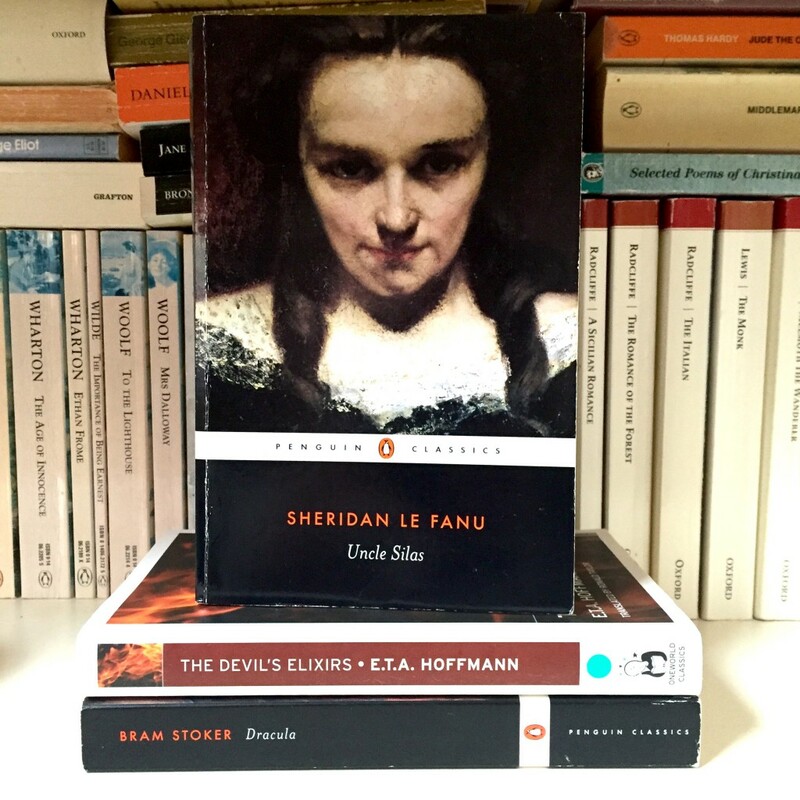 So far this year I’ve read Dracula and The Devil’s Elixirs, and for March I chose Uncle Silas by Joseph Sheridan Le Fanu. I can’t pin-point when I first heard of Uncle Silas. It’s not one of the massive-name classics, but I’ve been aware of it for a long time. I watched an interview with Guillermo Del Toro on YouTube in which he named Uncle Silas as one of the inspirations behind his film Crimson Peak. Cue instant book buying! I loved Crimson Peak, and since I’ve also been wanting to read more Gothic classics, I needed to get myself a copy of the book. Published in 1864, Uncle Silas is considered an important example of Victorian Gothic fiction. It also contains one of the earliest examples of a locked room mystery. I generally enjoyed Uncle Silas, though I didn’t think it was perfect. I thought the story started really well, and it kept me hooked until about the half-way point. The tension builds slowly as Sheridan Le Fanu sets up the scene. Naïve teenager, Maud, lives a sheltered life with her elderly, unsociable father, who we know is going to die at some point and leave her — and her massive inheritance — to fend alone. We know Maud’s going to end up in the house of her uncle Silas, and we can guess he might not be the nice old man she’s hoping for. After a lot of build-up, we finally meet the mysterious Silas about half-way through the novel. At that point, I thought the plot would really kick into gear. Instead, the tension eases off as Maud makes friends, has a social life and goes on country rambles. There are hints of things being amiss, but I thought the mystery aspect of the story got a bit lost until the very end of the book. The ending is action-packed and frightening, though, and it (almost) made up for the otherwise-slow second half. People who like their Victorian fiction dark and intriguing, but don’t want to have nightmares. For both April and May’s 2016 Classics Challenge I’ll be reading a H.P. Lovecraft anthology. I’ve never read any Lovecraft, so I’m excited!